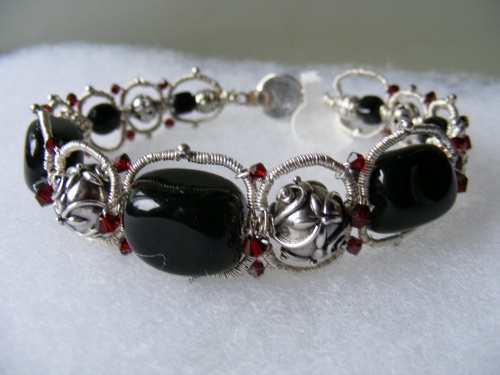 This gorgeous bracelet is made with onyx focal beads, enameled beads, bali beads and enhanced with garnet swarovski crystals. Very dramatic with its coiling all around the bracelet to bring out the color of the beads. Piece is made to be worn loose like a bangle and will fit from a 7 1/2" to 8 1/2" wrist.